Those that do soon find themselves in a world of signage that will intrigue, bemuse and delight. This is where I found myself during two years living and working in Kratie, a sleepy provincial capital in North East Cambodia. 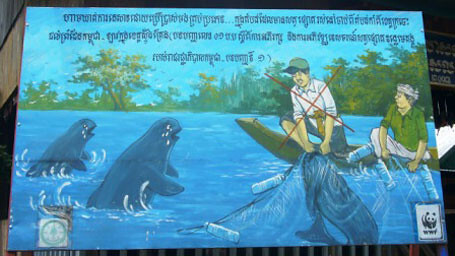 The sign reads, ‘Use of illegal fishing gears is prohibited in the dolphin habitats from the Laos border to Kratie’, promoting conservation and development in support of tourism (according to the law of Cambodia).The visual communication of the message is crucial when targeting rural populations with low literacy rates. The quirky nature of these hand-painted signs compelled me to capture them photographically and, in some cases, physically. I now own four originals, at least one of which has been replaced by a much less charming vinyl printed sign (see the before and after images below). This ‘modernising’ trend continues, even without the interference of foreign enthusiasts. The hand-painted form in Cambodia, as in many other countries, is currently under threat from the advance of new technologies. 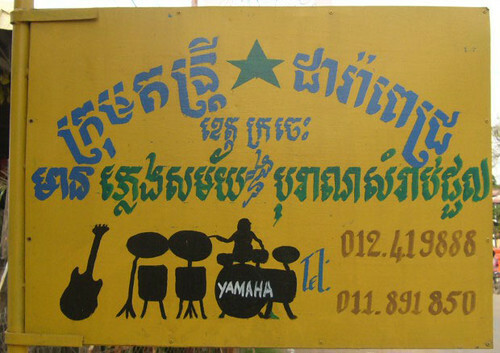 Translation: ‘Kratie Dara Pich music group. Pop music, classical music, available for hire’. One of the signs (right) that I have bought as a souvenir and its printed replacement (right below). 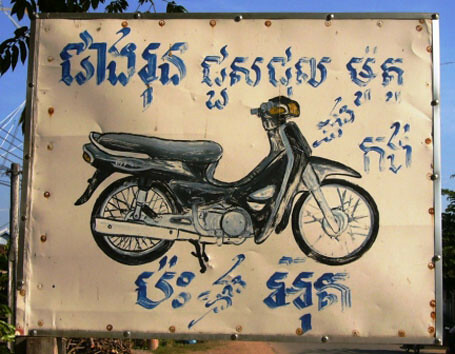 This isn’t the first time that Cambodia’s hand-painted signs have faced difficulties. The signs and the artists that produce them were victims of the Khmer Rouge era in the late 1970s, whom sought to destroy the arts and eliminated all private enterprise. It is remarkable that the hand-painted form managed to emerge from this persecution. The same was true for those with sign painting skills. Starting with Government and non-government organisations, the signs found a new lease of life after the Khmer Rouge regime ended. Before long this included businesses that quickly repopulated the streets with hand-painted creations advertising everything from motorbike repairs to animal mating services. 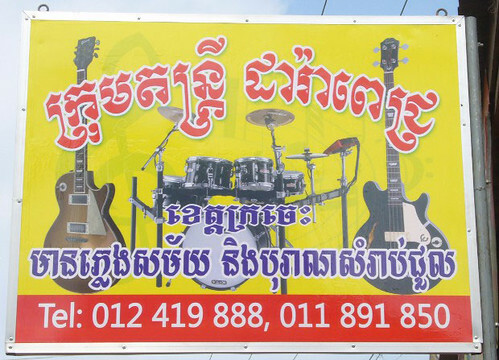 Translation: ‘Runh mechanic, motorbike and bicycle repairs and maintenance’. The motorbike pictured is the Honda Dream, Cambodia’s most popular model. 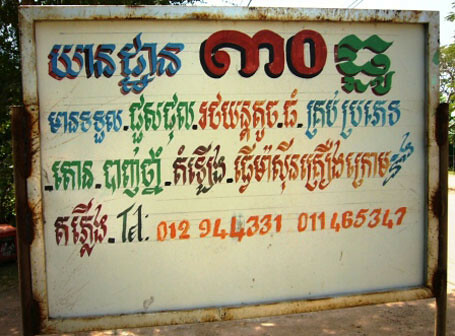 The lighter weight symbol in the middle of the bottom row of text is the Khmer equivalent of the ampersand. It is possible to spot the work of particular sign painters by looking at the way they produce this symbol. Recording the signs that have been produced in this revival since the 1980s means that at least this time they won’t be lost without a trace. 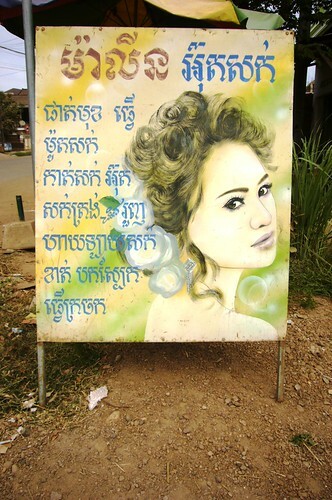 This is what I attempt to do in my book, Hand-Painted Signs of Kratie. In this, there are echoes of my previous work in the UK documenting the remains of hand-painted advertising on walls (aka Ghostsigns), which sought to record them before they fade to nothing. Both serve as a tribute to the skilled craftspeople that produced them. The cover design of Hand-Painted Signs of Kratie was commissioned to a Cambodian sign painter and is another unique hand-painted original for my collection. These hand-painted signs are a characteristic and charming feature of Cambodia’s streetscapes and perhaps one day there will be yet another revival of the hand-painted forms. 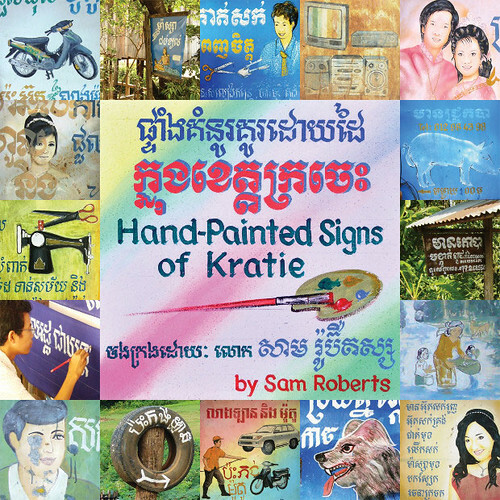 Hand-painted Signs of Kratie can be purchased in print or digital versions, alongside a host of other bonus material, on the dedicated website. The sign translates to, ‘30th December car repairs, large and small cars, chassis raising, painting and air conditioning repairs, undercarriage and light repairs’. The diversity of text colours on this sign is quite distinctive, each colour indicating a different service available at this mechanic shop. The unusual name of the shop is in recognition of the day that Kratie was liberated from the Khmer Rouge by the Vietnamese invasion. It wasn’t until 7 January (a public holiday in Cambodia known as ‘Victory over genocide day’) that these forces took the capital, Phnom Penh. 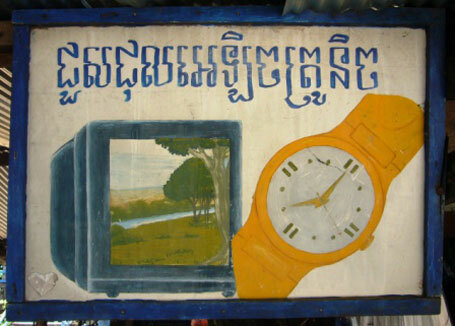 Right below: This sign was produced by Kratie’s most established sign painter, Sai Sokheang of the Chouk Rachana (‘fine paint brush art’) sign shop. He also produced the cover for the book.